One of our key advocacy goals is to strengthen child right perspective in Finnish development cooperation and programming. Advancing the human rights based approach (HRBA) as the guiding principle of development co-operation in Finland has a key role in supporting this objective. HRBA establishes that the fulfilment of the rights of the most vulnerable people, in particular children, needs to be the guiding principle in development cooperation and programming. It makes possible for children to be active participants in fulfilling their rights. HRBA ensures that children and their rights are not disregarded. In HRBA, international human rights standards and treaties define the goals of the development work. Human rights principles like equality and non-discrimination, participation, and accountability become the necessary guiding rules of the work. According to international human rights standards and treaties every child is seen as a legal holder of rights and the state has an obligation to ensure the fulfilment of these rights. 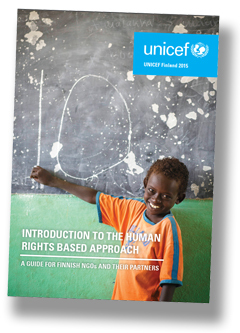 UNICEF Finland promotes the use of human rights-based approach in Finnish development co-operation. To advance this goal, we have developed a manual on HRBA that provides a practical introduction of the approach. We have also developed tools that can be used for introducing the approach and for training on its application as well as a guidance for programming using human rights-based approach. Together with academia and private sector partners, we are also implementing pilot program in Uganda where we test learning materials and practices connected to the human rights-based approach in action. Introduction to the human rights-based approach is a practical manual covering the basics of the approach, including information on how to apply the approach to development co-operation. The Manual is in English. Checklist for human rights-based approach to program planning includes series of questions designed to make HRBA visible in your planning and to ensure that your program has been developed following the principles of HRBA as much as possible. Questions help to understand some critical issues in different phases of project planning. Proper understanding of the Checklist requires your prior awareness of the basics of HRBA. The Checklist is in Finnish, as there are good HRBA checklists available in English already. Educational presentations made by UNICEF Finland are designed to support introduction and training on human rights-based approach for development actors. Slides include comprehensive basic information about the human rights-based approach supplemented with activation questions and group exercises that can be used to illustrate different components of the approach. Presentations are in English. Please familiarize yourself with the instructions below before using the presentations. Download the instructions on how to use the presentations from here. Introductory presentation gives a standalone overview of the entire issue of HRBA by briefly going through all its main concepts. A set of four presentations below is a longer version of the introductory presentation which discusses the same issues more thoroughly. For planning a project using human rights-based approach it is advisable to use the more detailed version of the presentation. Download the introduction from here. The first presentation gives an overview of the human rights instruments and principles guiding the goals and practices of the approach. The second presentation focuses on the concepts of rights-holder and duty-bearer and their relationship. It also dwells on the use of capacity gaps in human rights-based approach. The third presentation elaborates on the first steps of project planning using HRBA, starting with the situation analysis and going to capacity gap analysis. The fourth presentation deals with the final steps of HRBA project planning covering implementation phase and monitoring and evaluation. Questionnaire is designed to be used together with the HRBA training materials. It can be used before the training to evaluate the starting level of the participants’ knowledge on the subject and to modify the presentations to meet the needs of the trainees. However it needs to be noted that it is very difficult to answer the questionnaire without having any prior knowledge about HRBA. If you want to evaluate the impact of the training, it is also advisable to arrange the questionnaire after the training. This makes it possible to evaluate the success of the training and to define needs for further training. Questionnaire consists of seven open-ended questions which cover some of the most important aspects of the approach. It is advisable to adapt the questionnaire and make it relevant to the context of the training. Information about the expected levels of knowledge required to be able to answer the questions is available here.